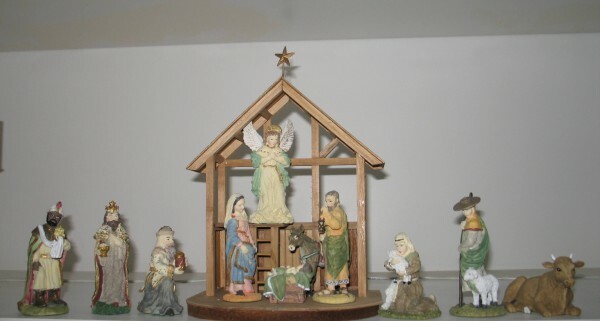 This is just one of the numerous nativity scenes that I put out each Christmas. They remind me of the reason for celebrating Christmas. Two scriptures come to mind that speak of God’s perfect timing. Jesus was born at the perfect time, and He died to save us at the perfect time. We can rely on God to work in our lives in His perfect way. His timing is the best timing. What has happened in your life to show God’s perfect timing? I will be giving away a copy of Second Chance Reunion, the first book in my Village of Hope series, to one person who leaves a comment. I was running short on cash to pay for propane for my gas tank when I received an unexpected check in the mail and the price of propane dropped prior to my gas tank being filled. kda, that is definitely a good example of God’s perfect timing. Hey Merilee, I feel like writing success, to whatever degree I have it, has come at the perfect time–just when my teen daughter needs me nearby, but not TOO near. Lots of time to write! Lee, I feel the same way about my writing career. I made my first sale at the perfect time. In 2011, the company I worked for was closed by the corporate offices. The job market at the time was terrible. A couple weeks before my unemployment checks were going to end, God blessed me with a better job than the one I had lost. Jill, that’s another great example of how God works in our lives. The fullness of time… sometimes I chafe at what seems to be a slow (or nonexistent!) answer. So often when I look back, I can see God’s perfect timing, after all. Waiting in faith can be hard! When I was a child my father was on unemployment and it was Christmas.A knock at the door revealed boxes filled with toys,clothes and food. Liinda, what a wonderful story! I wanted to comment on your nativity – reminds me of the one my mom used to have. Not sure what happened to that. Since we have just moved, we went out last night to buy some kind of outdoor Christmas decoration, preferably a nativity scene. Other than an angel blowing a trumpet, we could find NO Christian decorations at all. Very sad! We are hunting online now and if that doesn’t pay off, we’ll make something ourselves. Nothing so beautiful as a nativity … Thanks for sharing! Diane, I saw a nativity for the yard at Home Depot. I hope you find one. I want to get that one, but my hubby thinks I have enough Christmas stuff. There’s no Home Depot near us, but maybe we can order it online. Thanks! We got our outdoor nativity set at KMart several years ago – after Christmas – for 30% off! There is nothing like a nativity to start the season! Beautiful! Linda, I have a huge collection of them. I got a few, and then people started giving them to me. Finally, I had to say, “Enough.” I had no room for them. Now that we’ve moved to a new house, I’m finding it hard to find a niche for each one. Trixi, thanks for sharing. So glad your hubby likes his new job. God knows what we need. When my husband and I were going to Hong Kong as missionaries, our passports with our visas hadn’t arrived in the mail on the Saturday before we were to leave late Sunday night… We called the post office, and they said they could check the incoming mail on Sunday, but would not dig through the bags. We went to church Sunday morning and asked everyone to pray. As we were walking the house after church, the phone was ringing. The post office clerk was calling to say she had opened the first bag, and the envelope with our passports was sitting right on top! So we made our flight on time – praise the Lord!